'I do care about all the women you've abused and scarred and made life hell for,' says Mitali Saran. I know it's wrong, but I think about you all the time. I like to imagine you in your hair shirt, under your cloak of shame with a thick lining of regret. I'm very worried for you because the impossible has happened: Twitter is even angrier! Your deepest fears have come true -- the headlines have been taken over by hordes of angry, possibly hairy feminists with no sense of humour. Why can't they just relax and take a joke, right? They should get some sense knocked into them by the more understanding ladies, the ones who talk feminism and walk bro code, who agree with you that 'Men are like that' and 'If she's going to be a tease, she's got it coming' and 'Why did it take her so long to speak up' and 'She enjoyed the perks of the attention'. Maybe they could re-educate the less understanding ladies who go on about consent in every moment and sovereignty over one's body. Your life is being firebombed, screenshot by screenshot. It's just mayhem out there -- those vindictive women are breaking every rule in the big book of patriarchy, which is their big fancy word for 'society'. Can you imagine publicly, sometimes anonymously, sharing old texts, or anecdotes about your behaviour -- totally normal man behaviour! What's the fuss about a little feel or a little sexting or a little tongue or a little penetration, especially if she's awake? Some of them should be grateful that anyone is looking at them at all. Most importantly, what about due process? Isn't presumption of innocence the cornerstone of justice? 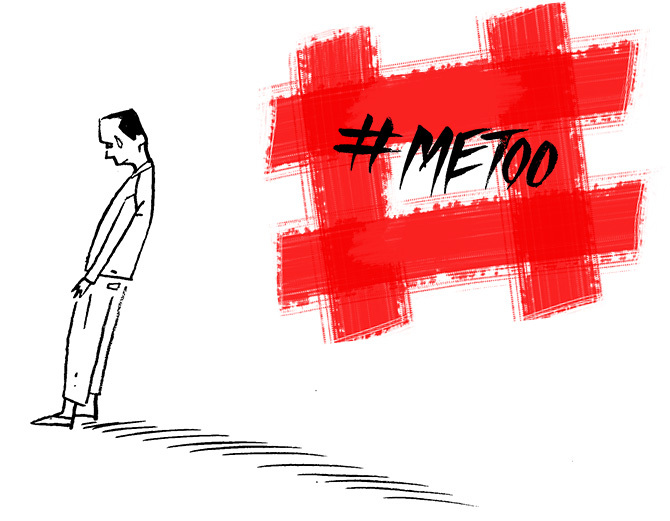 Last year when women in academia compiled a list of men accused of sexually harassing or assaulting people (known as #LoSHA), many ladies came through, insisting that one can't accuse people of harassment or assault without hard evidence. (Luckily, some hard evidence works like that perfect murder weapon, the ice dagger. Hyuk, hyuk!) This year, most of them agree that the same tactics are legitimate. Talk about rocking the boat and upsetting the applecart, both of which are owned, filled, and managed by people like you. Talk about tying up the farmer and setting fire to the farm. I mean, are these law-abiding citizens, or guerrillas rejecting conventional rules of engagement on the grounds that the power equation doesn't allow for it? Instead of smacking them down, companies are double checking to see if previous complaints were properly investigated, which, by the way, makes it look as if they are aware that 'due process' doesn't work. Whose side are they on, amirite? I mean, can 500 million bros be wrong? Women used to be cute when they were angry -- now they're scary af. Star editors, journalists, celebrity consultants, actors, directors, lyricists, comedians, leading lights in the NGO sector -- is nobody safe in the world you've created and run smoothly and comfortably for so long? I'm so worried about your future. Ha ha, just kidding! I don't care what you're wearing. I don't care what you're feeling. I don't care how accomplished you are, and I don't care about your career which has burst into pretty flames. I do care about your reputation -- I hope it never recovers enough for you to forget what it looks like right now. I do care about those of your family members who are appalled by your behaviour -- you've dumped a world of pain into their lives too. And I do care about all the women you've abused and scarred and made life hell for.